“When we did the small group sharing at the assembly, those were the three main concerns that came up for folks,” said Voices 4 Housing organizer Stacey Siebrasse. That’s the point of MIC is really to garner relational power, get people connected and talking about these issues, get them informed and be able to generate the public will to stand behind these things.”The housing trust fund would pay for things like permanent affordable housing, the preservation and rehab of existing affordable units and assistance for first-time homebuyers. If the city were to levy a bond, Peterson explained, protections would need to be in place for people whose housing stability might be threatened by the higher property taxes necessitated by the bond itself. Other forms of funding include a local option or resort tax, gas tax, private investments, or a required percentage of tax increment funding, or TIF. In addition, commercial linkage fees charge developers of commercial developments a fee that can be used for affordable housing. “We’re not going to advocate for a bond as the core funding source or the only funding source. We would need diverse funding sources that aren’t immediately tied to housing affordability,” she said. The group talked about adding a time-sensitive residency requirement and allowing the trust fund to span outside the city limits, which could require looking into a countywide funding measure. Those who have been previously incarcerated or have poor rental history or credit struggle with housing, having to pay multiple application fees to compete for apartments they won’t get approved for. 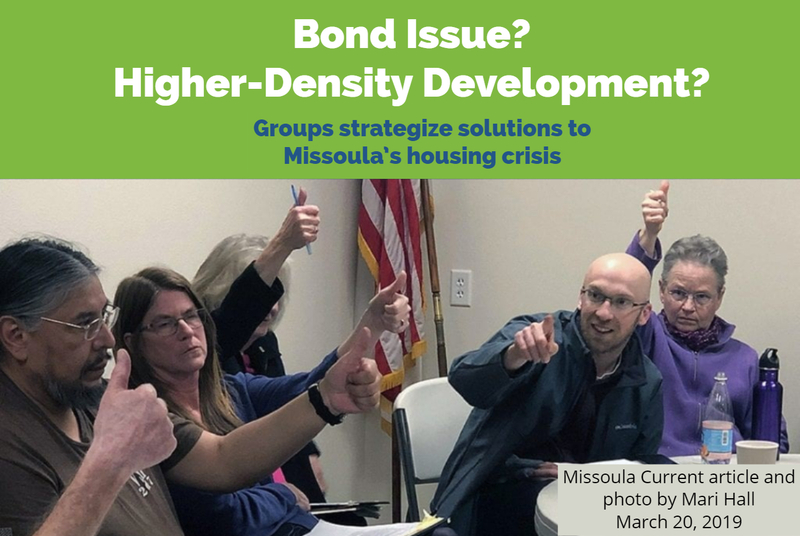 Having a rent guarantee fund as insurance to landlords and hiring a liaison to coordinate conversations between tenants and renters were two solutions that were widely accepted by group participants, said MIC’s housing advocate program manager Zeke Campfield. The second Voices 4 Housing assembly will take place May 2 after the city’s housing policy is published. These strategies will be introduced to the city and county for further discussion and improvements. Missoula County Commissioner Josh Slotnick and City Councilwoman Gwen Jones attended Tuesday night’s event and were impressed with the amount of civic involvement. Slotnick said the commissioners will address housing but isn’t sure what that looks like yet.